Economic journalists know full well this is a myth. Yet it is a myth repeated on countless occasions by the coalition parties, and by journalists working for the partisan press. On one occasion one of these journalists tried to rubbish a post where I wrote it was a myth, and I hope learnt to regret the experience. Just inspecting the chart in my last post shows this myth is nonsense. But the political commentators that are central to mediamacro seldom look at economic data. What they do remember of the pre-recession budgets of Gordon Brown was some criticism that he was not being as prudent as he might be. That memory is both correct (both the IFS and NIESR made that criticism) and the criticism is valid, as I set out in my study of this period. (To read the study free before the election, go here.) This is the half-truth that sustains the myth. But mild imprudence is not profligacy. We can see that by looking at another chart, for the debt to GDP ratio. Profligacy would imply a rapidly rising ratio, but this ratio before the recession (37% in 2008) was below the level Labour inherited (42% in 1997), and below its fiscal rule figure of 40%. No profligacy there. So the Labour profligacy argument on its own would fall apart, if it was not itself buttressed by another myth: the argument that the government should have been running large surpluses in 2007, because we were in the midst of a major boom. That myth is important and widespread enough to deserve a post of its own tomorrow. "The elimination of the UK's structural deficit [under Labour before the recession] would not have been even a sticking plaster in the face of the haemorrhaging of the finance sector's jugular"
I would also add that the Conservatives not only argued for even less financial regulation before the financial collapse, but opposed Labour's measures to moderate the recession in 2009. "This is the Tory press, sir. When the legend becomes fact, print the legend." five years of non stop propaganda has created the legend , not enough people will bother to read your interpretation and explanation of the facts. However thank you for setting the record straight. To compare the debt to GDP ratio in 1997 (when it had just peaked after the early 90s recession) with the level in 2008 (after a major credit boom) and before the subsequent recession and to state that this means there was no Labour profligacy is disingenuous, to say the least. Simon Wren-Lewis should compare the debt/deficit situation before the early 90s recession with those before the 2008 crash if he ants t make a fair comparison (which, of course, he does not). Were he to do so, he would see that prior to the early 90s recession were were running a 2% surplus and debt was down to around 26% of GDP - a much better starting point. But doesn't that mean that debt rose from 26% to 42% under Major - between the early 90s and 1997? It looks like it's the Tories who are profligate to me. Magnus Carlsen, A bit like the US, where Republicans object the loudest to deficits, despite having been responsible for the biggest deficits over the last 50 years or so. Of course the National Debt rose in the early to mid 1990s-there had been a severe recession. The entirely reasonable point being made is that the debt level as at 1990 (26%) should be compared with 2007. The early 90s recession ended in 1991. Debt continued to rise through 1992-97 (during which there was no recession) because the Conservatives continued to cut taxes (especially for the better off). That debt was at 26% in 1990 is the artefact of the mass-selling at below market prices of public assets through the 1980s (selling off the family silver in the words of a more reasonable Conservative), and indeed North Sea Oil and Gas revenues. Indeed the flogging of these assets at knock-down prices dwarfs any action of New Labour in terms of profligacy. @Anon. Profligacy implies danger. You make a value judgement that the debt is a problem, and that running surpluses at that phase of the cycle is a benefit. Simon's graph shows simply that the debt level was within normal parameters (therefore not dangerous) and hadn't risen since the Major days (so can't be accused of an excess increase in expenditure). 'Prior to the 90s inflation there was a 2% surplus'. Hmm, funny that. "The early 90s recession ended in 1991. Debt continued to rise through 1992-97 (during which there was no recession) because the Conservatives continued to cut taxes (especially for the better off). That debt was at 26% in 1990 is the artefact of the mass-selling at below market prices of public assets through the 1980s (selling off the family silver in the words of a more reasonable Conservative), and indeed North Sea Oil and Gas revenues." Deficits always persist after a recession - they don't immediately disappear once there is growth. The reduction in the debt was a result of low deficits followed by a surplus. Asset sales were relatively unimportant. North Sea oil revenues were helpful but smaller than is usually imagined (at their very peak, they never exceeded 5% of GDP) and of course they reached their highest levels under Labour. Deficits don't persist for 6 years after a recession, especially after one as short as in the 1990s. The debt increase was conservative profligacy, and successive tax cuts in particular. Debt was still increasing in Major's last year. If North Sea oil revenue equal say 2% a year, then 10 years of this wipes 20% off Debt/GDP. This is meaningful. And where do you get your assertion that North Sea oil revenue peaked under Labour? Even in revenue terms this is not true, and as for % of GDP, this was considerably higher in the 1980s than in the 00s. The only thing you are right about is the fact that debt falls when deficits are low and surpluses are achieved. However these flows were achieved off the back of wholesale privatisation proceeds and substantial north sea oil revenue. - "... disingenuous, to say the least." - "...if he ants t make a fair comparison (which, of course, he does not)"
Whereas Magnus Carlsen is replying with to-the-point facts and logic. Of course, "Anonymous" could still be right. But it looks as though he wants to make others angry to hide the emptiness of his own analysis. He would certainly improve the quality of the debate if he confined himself to making points rather than trolling. "Deficits don't persist for 6 years after a recession"
The last recession was in 2008. We still have a large deficit. Labour only planned to halve it by now which is what the Tories have actually done (approximately) - so you cant simply put it down to the current government and hence your assertion is disproven. Speaking of disingenuous: Anon just tried to pretend that the persistent deficits following the 1991 recession are some how excused by the persistent deficits after the 2009 recession. As if there were no obvious reason at all why these situations were not comparable. Thank you for a clear analysis. These 'instalments' are really useful in breaking down the subject into manageable chunks for the non-economist. It is worth remembering that Vicky Pryce was not very good on Greece in 2010, but seems to have changed her mind, presumably as the facts became clearer. "But doesn't that mean that debt rose from 26% to 42% under Major - between the early 90s and 1997? It looks like it's the Tories who are profligate to me." No, because the rise from 26% to 42% was a result of the early 90s recession. Taking the figures under Labour only up to 2008 deliberately excludes the recession that followed. The average deficit from 79 to 96 was 3.2%. The average deficit from 97 to 07 was 1.3%. Now maybe those numbers are distorted by the economic cycle, so if we choose the OBR's cyclically adjusted numbers we get 2.6% and 2.1% respectively. QED! And that despite massive sales of state assets which reduced deficits when they happened, but increased them afterwards (as assets sales always do). Good point, although Labour also did a lot with public private partnerships. True, and in my view that is the only way in which Labour can be even remotely described as "profligate". It is hard to defend against the claim that PPP just manipulated the indicators. Of course, it is again a case of Labour being at fault for using right-wing policies, so to use that as a way to claim that Tories would be better at managing the economy would be quite rich. "The average deficit from 79 to 96 was 3.2%. The average deficit from 97 to 07 was 1.3%. Now maybe those numbers are distorted by the economic cycle, so if we choose the OBR's cyclically adjusted numbers we get 2.6% and 2.1% respectively. QED!" The only thing you have proven is that by choosing an artificial timescale for comparison which ends in 2007, thereby excluding the recession, that you somehow think you can deceive people. Better luck next time. I often wonder why people write comments like this. It convinces no one, as people who read this blog rather than troll it are intelligent (and remember that the myth in question is that Brown was profligate before 2008), so unintelligent comments just reflect badly on your point of view. Well, 'Mainly Macro' - you clearly have no defence to the point I made, instead preferring to throw the childish 'Troll' accusation. Unfortunately, for you, some of us are intelligent and can see right through your attempt to deceive. The fact is that you chose to compare the period of the last Tory government with just part of (instead of the whole of) the period of the last Labour government, deliberately excluding the recession. Why would you do this unless you were attempting to paint a false picture? BECAUSE the myth in question is that Brown was profligate before 2008!!!! If it was your intention to expose the 'myth' of Brown's profligacy, then you would have compared the rise in spending and the deficit leading up to 2008 with the rise and spending with the deficit leading up to the early 90s recession. The fact is that after 2001, Brown increased government spending at a record UK peacetime rate and faster than any other G8 country. Spending grew much faster than the economy as a whole. I am sure you know that unsustainable credit booms also provide booming and unsustainable tax revenues. When the boom ends, tax revenues fall substantially. Therefore, it is prudent to run very small deficits or even surpluses during the good times, thus reducing GDP as a percentage of GDP. Prior to the early 90s recession, the Tory government at least had the sense to use these booming revenues to run a surplus (or around 2% of GDP) and cut the debt as a result to around 25% of GDP. This, when boom turned to bust, the public finances started from a good position. The last Labour government, however, saw fit to start increasing debt again as a percentage of GDP and we entered the recession from a position of running a 3% deficit at the height of the boom. If that isn't profligacy, I don't know what is. We would not have a deficit at all now if we had entered the recession with the fiscal position being 5% of GDP better (i.e the difference between a 2% surplus and a 3% deficit). The other criticism of Brown's spending was that it wasn't counter-cyclical - it actually helped feed the boom. Love your graph of UK debt/GDP. It might be interesting to overlay it with the same graph for the US. Impressive drop in this ratio from 1945 to 1980 in both nations. 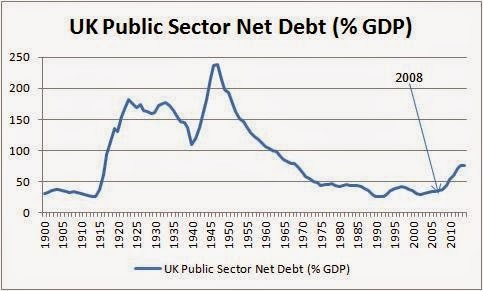 Between 1981 and 2007, the UK kept it debt/GDP from rising. But the US saw increases in the 1980's and after 2000. Can I ask why you are so pessimistic about Ed Miliband´s chances of being the next PM? I follow Mike Smithson on Twitter, as I know you do, and from there see that the Betfair exchange has him at an implied 60% probability of becoming PM, compared with 40% for Cameron. The polls, meanwhile, are still roughly neck and neck which implies a sharp swing to Labour versus 2010 and a reasonable chance of being the largest party, even allowing for Scottish losses. First, I think with this particular election putting too much faith in the polls is a mistake (and they have also failed in the past with simpler cases). Second, even a 40% chance of disaster is still way too big for me to feel comfortable. Thanks for this Professor. One question: given demographic changes (principally the retirement of the baby boomers) the resources required for the NHS and social care will increase substantially in the next few decades. Simon Stevens predicts that the NHS will need £30bn/year extra by 2020 to maintain current standards, for example (although >2/3 if that he thinks can come from internal efficiency savings). While debt/GDP didn't increase a lot prior to the crisis, surely it should have been falling to smooth out this (predictable) demographic burden? That would take a proper intergenerational distributional analysis. In essence the question is: do we pay for higher future spending by raising taxes when that spending arises, or raising taxes today. Thanks. I agree on the question. But at first pass it seems plausible that debt/GDP "should" have declined much further from the mid-1990s-2008. In my study of fiscal policy under the Labour government, I did comment in hindsight that the fiscal rule involving a fixed 40% of GDP debt target was probably a mistake, and that a gradually declining ratio would have been more appropriate. However I do not recall much criticism along those lines at the time. Deregulation was course not the cause of the GFC, although some like to promote that idea now usually to advance a particular political view. Gordon Brown however ignored warnings from the Conservatives that the regulatory regime he was creating would lead to problems. It is therefore an error, again usually promoted to advance a particular political view, to suppose the Conservatives would have done the same. Lilley is being about as dishonest as he used to be when he was a minister. The plain-language meaning of his remark from 1997 is that the process of setting up the FSA might distract regulators' attention while it was going on. It was not, I think, still going on in 2007. Further, his claim that he would have regulated the banks is very strange seeing as he thinks there was too much regulation. Surely, if he means this, it would be better if the FSA was distracted? Finally, the Bank of England certainly was "responsible for ensuring the liquidity of the banking system". That's why it lent the banks enough cash to clear payments so long as they were solvent and could post collateral. That's what it was doing. That's what it means to "ensure the liquidity of the banking system". Lilley might have had a point, had he said "solvency". But he didn't, because he didn't and doesn't believe in financial regulation, and still hasn't admitted that the deregulated finance wonderland he stood for as a Conservative was a disaster. The acceleration in government spending in 2002 in absolute terms and as a % of GDP, in the "good times", is pretty evident in chart 2.1(a). A good illustration of Labour "profligacy", aka Gordon Brown's master plan to win an election he expected to call in late 07/early 08 or so. Bad luck for him it was subsequently postponed/derailed by other events. Illustrates, too, the danger of trying to put party before country. It's amazing what partisan politicising can do to your memory. Am I right in thinking this only includes balance sheet debt? What does the analysis look like if total debt (ie including pension liabilities and off balance sheet debt) is included?